If you are looking for an up-to-date king size bed; the modern king beds could be something you can have a look. Because these are called modern; normally these would not be old styled beds. Create a timeless and elegant sleeping space in your bedroom with this appealing Lafayette Upholstered Bed by Castleton Home. This contemporary bed features a tufted headboard upholstered in microfiber fabric which is available in 2 beautiful colors. This bed is designed to be used with a mattress alone which eliminates the requirement of box spring or foundation. Offers 2 colors to choose from: Grey and Oatmeal. Includes slats to support mattress. Accentuate the elegance of your bedroom décor with this classy Zack Upholstered Platform Bed. Solid wood construction renders this bed a sturdiness and endurance. This graceful Zack Upholstered Platform Bed features a scalloped headboard, upholstered with linen and generously padded with foam for maximum comfort when you lie against it. Matching button tufts and silver nailhead trim detailing add value to the overall of this gorgeous bed. Zack Upholstered Platform Bed Collection. Available in 2 colors: Grey and Light Beige. Headboard and slat support system included. Matching button tufting with silver nailhead trim detailing. Linen upholstery with foam padding. Available in king, queen and full size. The Varick Gallery Upholstered Panel Bed will adorn the beauty of your elegant bedroom setting with its stylish and appealing design. This sturdy and durable panel bed is constructed from wood and is available in two beautiful colors. The bed frame is upholstered with linen. The bed features a generously padded headboard with biscuit tufting that enhances the overall appeal of the bed. Varick Gallery Upholstered Panel Bed Collection. Bed frame constructed from wood. 2 aesthetically charming colors: Grey and Light Beige. Includes headboard and slat support system. Requires both mattress and box spring (not included). Available in multiple sizes including twin, king, queen and full size. Add captivating charm to your bedroom with the attractive design of Sharon Platform Bed by Sharelle Furnishings. This Italian style low platform bed proves to be a great addition to Italian bedroom setting. The trendy Sharon Platform Bed is a multifunctional bed that features an upholstered headboard with 2 nightstands on each side with a drawer. 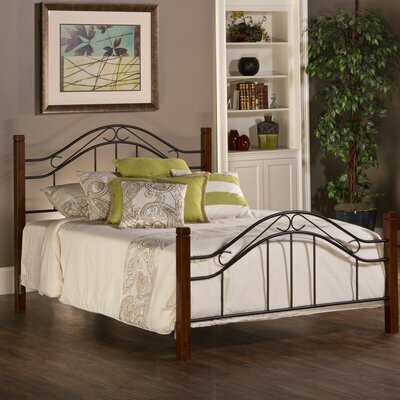 Constructed from kiln dried tropical mahogany wood, this bed is sturdy and long lasting. This modern bed includes slat support system to ensure adequate support to the mattress that eliminates the need for box spring. Available in numerous sizes and finishes, this non-toxic and gorgeous bed can be assembled with the help of a screwdriver. 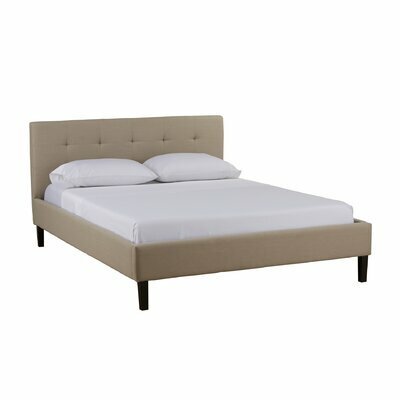 Bed Type: Italian style low platform. Manufactured from kiln dried tropical mahogany wood. Attached nightstands on each side with 1 drawer. Choose from 3 available finishes: Black Lacquer, White Lacquer and Wenge/White. Headboard and removable slats are included with the bed. Headboard is fully upholstered in leather with square tufting. 5 center support legs provide additional stability and endurance to bed frame. Available in 3 different sizes (California size, king size and queen size). Easy to assemble with the help of a screwdriver. Maximum weight capacity is 500 lbs. 1 year limited product warranty against manufacturer’s defects. Designed with sleek lines, raised panels on the headboard and footboard and slightly flared feet, the Marblewood Canopy Bed is a beautiful bed to accentuate your bedroom setting. Made from engineered wood and hardwood solids, this bed is long lasting with its sturdy and robust bed frame. 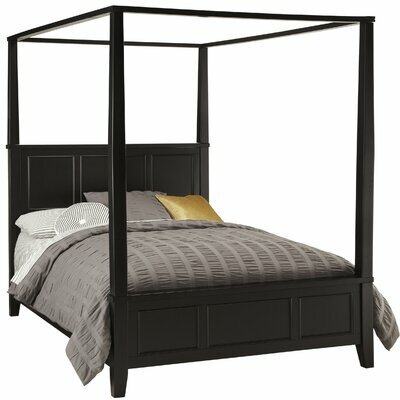 The Marblewood Canopy Bed features a bold black finish and a tall canopy which can be used with curtains to create a royal look. This eco-friendly bed is available in multiple sizes to suit your requirement. Cottage/Country; Modern; Traditional; Vintage style. Manufactured from engineered wood and hardwood solids. Sturdy bed frame with slightly flared legs. Slightly raised panels on the headboard and footboard. 3 slats ensure support and stability of mattress. Requires box spring required but not included. King and queen size beds available. Can accommodate a sleep number. 30 days product warranty for parts. Create an alluring focal point in your modern bedroom décor with this trendy Thompson Upholstered Platform Bed by Modloft. This gorgeous platform bed has a floating appearance. The Thompson Upholstered Platform Bed features a splendid headboard upholstered in bonded leather which is square tufted in symmetric pattern that adds appeal to the overall look of the bed. The bed comes with solid pine-slat base for stylistic durability and added comfort. Durable inner base of the bed lifts it off the ground to create a grand and charming appearance. Slats are made from pine wood. 4″ thick frame around the bed. Inner base which lifts the bed off of the ground. Add a touch of elegance and grandeur to your bedroom décor with the contemporary style of Wildon Home Applewood Contemporary Upholstered Bed. This graceful bed features an upholstered bed frame with three metal slats that ensures adequate support for the mattress. Made from manufactured wood, wood veneers and solids, the bed frame is sturdy and durable. Upholstered in chenille fabric, the Applewood Contemporary Upholstered Bed adds a stunning appeal to any room décor. The headboard bows out slightly and the top lip curves back at a slight angle to make it perfect for you to lie against while reading or enjoying your bed tea. Constructed from manufactured wood, wood veneers and solids. Finish or Fabric: White; Brown. Chamfered trim with clean lines. Smooth veneered tops and straight edges. Anchored by dark wooden tapered feet. Headboard and footboard included with the bed frame. 3 metal slats provide support and stability to mattress. Available in California king, king and queen size. Maximum holding capacity is 350 lbs. Just look at this gorgeous bed and we promise you that you can’t take your eyes off this stunning beauty! 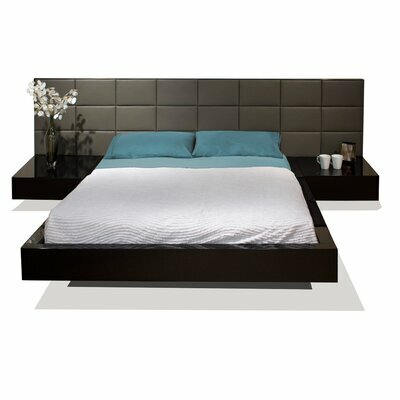 This trendy Montecito Platform Bed by DG Casa is sure to adorn the visual appeal of your bedroom. This classy bed features an upholstered bed frame with uniquely designed headboard and footboard that adds further charm to its majestic look. Bonded leather upholstery with pure white finish of this graceful bed creates a subtle style statement in any bedroom décor. The slat support system provides adequate support and stability to the mattress to ensure best sleeping experience for you. Sleek line design with curved headboard. Back of the bed and headboard is finished. Slat support system included to support mattress. Easy on wallet as doesn’t require box spring. Can also accommodate TempurPedic mattress. Enhance the visual appeal of your stylish bedroom décor with this stunningly gorgeous Chesterfield Upholstered Platform Bed by Liberty Furniture. 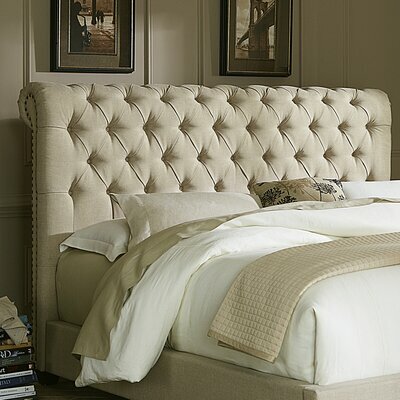 The lusciously padded headboard of this classy bed is tufted with matching buttons and the nickel nailhead trim on the side panels adds a lot of aesthetic appeal to its lovely design. The rolled headboard gives a royal touch to this beautiful platform bed. Upholstery fabric is linen with 15% cotton and 85% polyester. Includes upholstered bed frame with headboard, footboard, bed rails and slats. Rolled headboard with matching button tufting. Nickel nailhead trim on side panels of headboard. Queen size bed includes 3 wooden slats. King size bed includes 4 wooden slats. The artistic design of Chittim Panel Bed makes it an excellent choice for any bedroom setting. The Chittim Panel Bed features a mixed media package including both solid hardwood and metal construction. The bed posts are made from cherry finished wood while the headboard and foot boards boasts curving accents in metal. Product Care: Dust with a clean and dry cloth. Constructed from both solid hardwood and metal. Bed comes with headboard, footboard and bed rails. Easy to assemble with the help of Allen wrench.